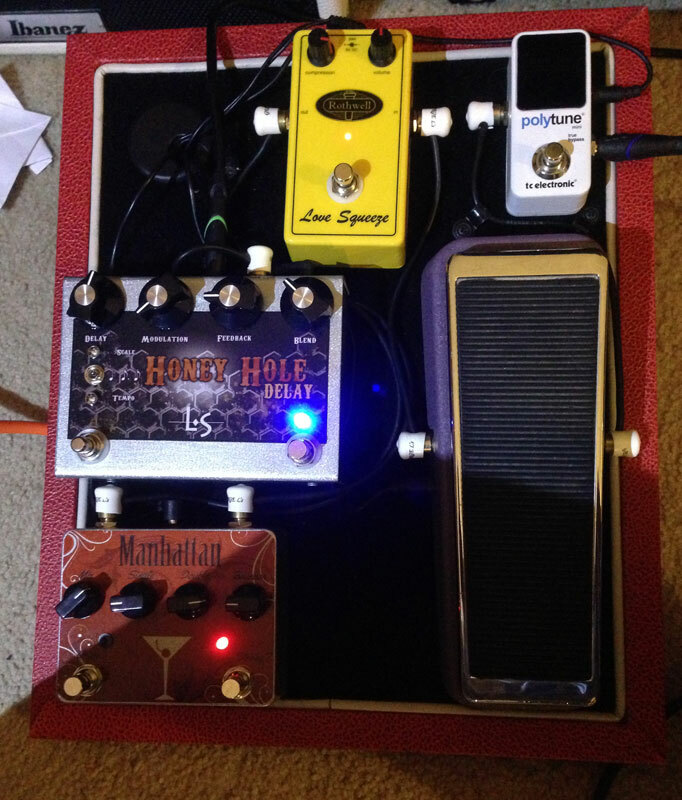 Today’s pedal line is from Shawn Lumen. If you have a pedal line (doesn’t have to be in a board) for your rig, please email me a photo, bio, description of pedals and routing to pedalline@nulleffectsbay.com. Every Friday I’ll showcase a pedal line submission. Make sure you include any links to your band or music page. Thank you to Hank for giving all of us guitarist(big and little string) a place to check out what’s going on out there. A place to share our hard work and investments towards creating good tone, our own unique tone, or just trying to get that spot in cover band. Effects Bay, my hat is off to you. The signal path goes like this. T.C. Electronics Mini Polytune, a very small footprint. The polyphonic aspect of this unit is priceless once you see and understand what’s really going on. Budda BudWah, my oldest pedal. It has true voice style qualities, no volume spikes or drops, and silky smooth tone from heal to toe. Sweet. Rothwell Love Squeeze Compressor, I have to say thank you to Kent Pham, store Manager Guitar Center, Reno Nv. for taking in this pedal used and putting it on the self with my name on it as soon as it came in. This pedal works perfect for me. It has punch, the squish you find in most compressors is not found in this pedal. Super quite, with both knobs at 3 O’clock it does not clip or break up at all and is a tad over unity gain.Thank you Kent! Tortuga Manhattan Flanger. WOW! Awesome. I can’t find any fault in the price of this pedal. I don’t play guitar with dollar bills of any denomination, but when I get done playing, I’m always handed money. I can’t say enough good things about this pedal. You want beautiful tone? Matt Johnson’s pedals are about beautiful tone. L-S Effects Honey Hole Delay, how do I put this,….? I’ve owed both the Strymon Brigadier, and El Capistan, I still own, PTronix Echolution, Maxon AD999Pro, T.C. Electronics Flashback X4. Well I can say this, tomorrow and many Sundays to come, the Honey Hole has earned it’s permanent spot on my pedalboard. It not only serves as my delay, but this pedal is truly musical. Warm, Fat, Rich, Clean. These pedals are powered with a T-Rex Fuel Tank jr.
They’re connected together with George L’s .155 brass right angle. One more time, Thank You Hank!